Recent detections of Xylella fastidiosa in Corsica Island, France, has raised concerns on its possible spread to mainland France and the rest of the Mediterranean Basin. 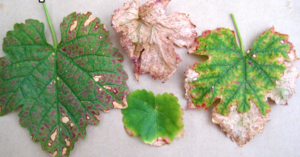 Early detection of infected plants is paramount to prevent the spread of the bacteria, but little is known about this pathosystem in European environments, hence standard surveillance strategies may be ineffective. We present a new methodological approach for the design of risk-based surveillance strategies, adapted to the emerging risk caused by X. fastidiosa. Our proposal is based on a combination of machine learning techniques and network analysis that aims at understanding the main abiotic drivers of the infection, produce risk maps and identify lookouts for the design of future surveillance plans. The identified drivers coincide with known results in laboratory studies about the correlation between environmental variables, such as water stress and temperature, and the presence of the bacterium in plants. Furthermore, the produced risk maps overlap nicely with detected foci of infection, while they also highlight other susceptible regions where X. fastidiosa has not been found yet. We conclude the paper presenting a list of recommended regions for a risk-based surveillance campaign based on the predicted spread and probability of early detection of the disease.